Due to the living environment and working environment and other causative factors, the onset of skin cancer is increasing continuously. However, many skin cancer patients don’t know the symptoms very well. 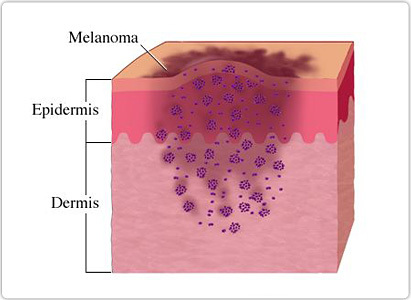 Which is not benefit to the early detection of skin cancer, said by experts from Modern Cancer Hospital Guangzhou.So what are the symptoms of skin cancer? 1.Squamous cell carcinoma is often transformed by keratosis, leukoplakia and other precancerous diseases. It grows fast and forms ulcer in early stage. Some of the ulcers manifest in the shape of nodus or cauliflower and invades relative superficial level, and its basis is movable.Some manifest in as patelliform and invades into the in-depth obviously, and has a strong devastating power, often to bones. Squamous cell carcinoma often causes pyogenic infection companied with evil smelling, pain. Multiple areas of lymph nodes metastasis, huge squamous cell carcinoma on head of skin cancer patient, have relatively much purulent secretions and easily bleed; if metastasis occurs in the neck, then the fastest growing position shall be the squamous cells adhered to mucocutaneous skin, often mucosa patients easily emerge metastasis. 2.Basal cell carcinoma often has no symptoms in the first beginning, often causes stiff and plaque papule in early stage: some manifest verrucously uplift and then ulceration for ulcer lesion in irregular shape and with its margins uplifting and bottom uneven, which grows slowly; metastasis seldom occurs, often marginal translucency potential ulcer goes first and then gradually expands to the surrounded tissues, even organs, and finally becomes invasive ulcer. 3.Squamous cell carcinoma often occurs among people from the age of 30 to 50 years old, while basal cell carcinoma occurs to people above 50 years old. The former one grows faster in a very short period than the later one; it often occurs in lips, tongue, nose, cunnus, cross section of skin mucous membrance; the margin of ulcer elevates and features red and stiff, which manifesting as circular or cauliflower-like, and there is remarkable inflammation reaction surrounded and multiple area of lymph gland enlargement; the later one often occurs in eye orbitalis, endocanthion, nose, cheek, forehead, back of hand; the margin of ulcer manifests wax-like or nodiform, enrolling, and features color of black, and there is little or no inflammation reaction and seldom metastasis, and it mainly invades toward in-depth tissue. 2.Margin: often irregular and serration-toward changing. This is usually due to tumor transferring to surrounding tissue or its own cataplasis. 5.bnormal sensation: itchy, burning pain or tenderness for local parts. Experts of Modern Cancer Hospital Guangzhou remind that if the above-mentioned symptoms appear, go to standardized hospital for timely diagnosis and treatment and try do not delay the treatment and degrade the condition.